As a dividend focused stock analyst, I put less emphasis on short term share price fluctuations, and more on dividend yields and dividend growth prospects. When the market turns volatile, such as what we have experienced in the last several months, it is good to go back to the basics of dividend investing. One of those basics is to invest for dividend growth. A growing payout should, over time result in a higher share price. 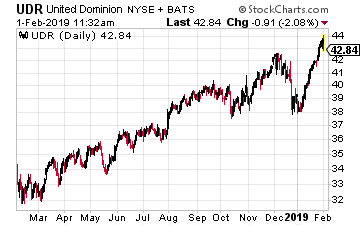 One nice way to get a quick start to capital gains from dividend growth is to buy shares just before an announced dividend increase. I maintain a database of about 130 REITs, which I use to track yields and dividend growth. 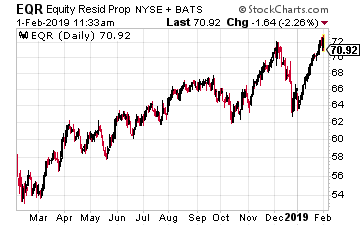 The typical REIT increases its dividend rate once a year, at about the same time each year. Across the REIT universe, the dividend increase announcements come in almost every month of the year. Each month I like to cover the REITs on my list that have historically increased their payouts in the following month. You can use this information to establish longer term positions in stocks with growing dividends or try for the short-term capital gain that often occurs when a dividend increase is announced. Here are the potential REIT dividend increases for March. Taubman Centers, Inc. (NYSE: TCO) acquires, develops, owns and operates regional and super-regional shopping centers. The company has grown its dividend by a 6.9% average annual compound growth rate for the last 10 years. The dividend rate was boosted by 4.8% last year. Despite a challenging retail environment in 2018, the company was able to generate growth in all its key financial metrics. The current dividend rate is 66% of 2018’s FFO/share cash flow guidance, so a moderate dividend increase is probable to keep the growth track record going. I forecast a 4% to 5% increase in the quarterly payout. 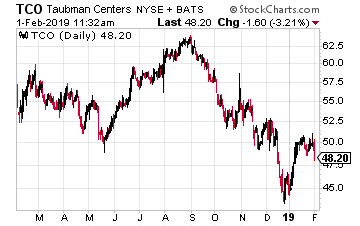 Taubman Centers should announce the new dividend rate in early March. UDR, Inc. (NYSE: UDR) owns and operates multi-family apartment complexes. The company increased its dividend by 4.0% last year and has averaged annual dividend growth of 6.7% over the last five years. The dividend has been increased for eight straight years. Adjusted FFO per share was up just 2% for 2018. Apartments have recently been viewed as a hot REIT sector that is slowing. Despite lower investor expectations, recent results from other apartment REIT have reported continued above average growth. UDR should announce its new dividend rate in the second half of March. UDR yields 2.9%. Equity Residential (NYSE: EQR) is an S&P 500 company focused on the acquisition, development and management of rental apartment properties located in urban and high-density suburban markets. The company owns or has investments in 306 properties consisting of 79,260 apartment units, primarily located in Boston, New York, Washington, D.C., Seattle, San Francisco, Southern California and Denver. Last year, the EQR dividend was increased by 7.2%. The five year growth rate is 6.5% and the dividend has grown for eight consecutive years. A new dividend rate will be announced in mid-March with payment in mid-April. EQR currently yields 3.0%.